Hello all of you out there. I am a couple of kilo's overweight, but not obese in any way. Yet, I have had a severe cellulite problem all my life. Just like my mother. So deff. genetic factors there. 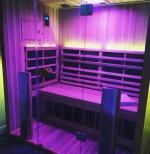 Because of it, I bought an infra red cabin to help me detox. Since then, I have been sweating every day. It's wonderful. I feel better, I am happier, the pain in my shoulder has significantly diminished. I sleep better. Not only me, but the whole family (three daughters, a dog and a husband) also enjoy the sauna. But the absolutely cool thing is…………My cellulite is clearly diminishing. WOW. No joking. It works. It really really works. Ps: The sauna we bought is a 2 person sauna, of very good quality. We paid 890 euro's for it. It just is so good for ya.